During these slow preparations for 2.0 release, I figure out how EDE does not have any kind of notification service, where applications could report custom statuses. I'm using Fedora Xfce Spin, where I replaced Xfce with EDE and recently I removed all Xfce applications and libraries from the system. This affected Xfce custom notification daemon which displayed various infos (e.g. firefox download status, VirtualBox driver update and such). AFAIK, more and more apps are using this notification specification which is good. So here it is, with humble name: ede-notify-daemon. It support important parts of the spec, where the rest I will leave for upcoming versions. 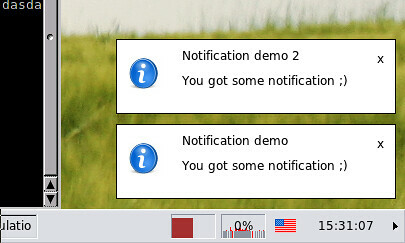 Truth to be told, I will (probably) never implemented full specification as it badly complicate simple thing as displaying notifications. I'm wondering are those GNOME/KDE guys come up with anything simple or we will at the end start to roll (again) own solutions? There is no configuration options for ede-notify-daemon; this is planned to be done in 2.1 release.